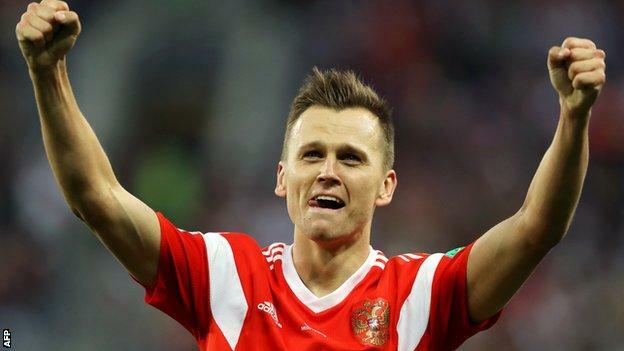 How did you rate the Russia and Egypt players? This is the first time Russia have won their opening two matches at a World Cup since 1966 (as the Soviet Union), when they reached the semi-finals. Russia’s haul of eight goals in their opening two World Cup games is the joint-highest for a host nation, level with Italy in 1934. Russia have scored more goals in this World Cup (eight) than they did in their two previous tournaments combined (six across both 2002 and 2014). The eight goals in Russia’s two matches so far is equal to the total Spain scored in their seven matches to win the tournament in 2010. Thirteen of Russia/USSR’s 19 wins at the World Cup have been by a margin of at least two goals, including the past seven. There have already been 10 penalties awarded in 17 games at this World Cup, the same number as in the entire group stages of the 2014 tournament (10 in 48 games) and just three fewer than in the whole 2014 tournament (13 in 64 games). There have now been five own goals at the 2018 World Cup – the only tournament to have more was in 1998 (six). 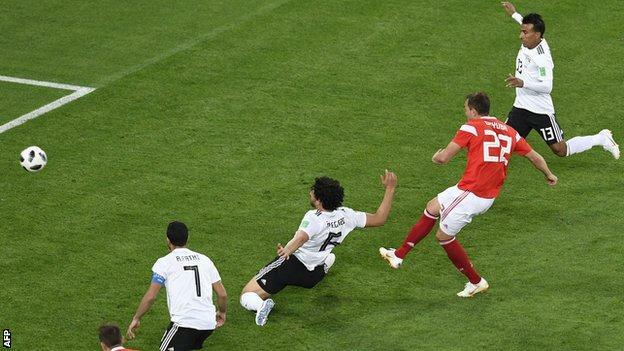 Each of the past eight goals Egypt have conceded in World Cup matches have come in the second half. Mohamed Salah became the third player to score for Egypt at the World Cup, after Abdelrahman Fawzi (two in 1934) and Magdy Abed El Ghani (one in 1990). Russia coach Stanislav Cherchesov said: “It is not an accident that we have two wins under our belt. We have a group of solidarity. We need to rest well and see who is ready to do what and prepare ourselves well for the next game. “We have learned from our mistakes that did not allow us to be more successful in the past and we are very happy that we have two wins and very happy that we are giving this joy to our supporters. Egypt coach Hector Cuper said: “Whether I will continue with the team or not we have to see. We will try to finish this World Cup in the best possible manner. On Mohamed Salah, Cuper added: “I was told he was feeling good. Of course, he could not prepare with us in the training camp and had to train alone so that might mean his total physical condition may have been reduced. I think he was OK [to play]. “If he had not injured himself in the Champions League final then he would have had an extra three weeks to train with us. “We all know what he means for the squad. He is a vital player – the focal point – and has given the team a great satisfaction. He suffered an injury and we have all been worried about it. We would have all preferred his injury to not occur. Match ends, Russia 3, Egypt 1. Second Half ends, Russia 3, Egypt 1. Attempt blocked. Tarek Hamed (Egypt) right footed shot from outside the box is blocked. Assisted by Abdallah El Said. Amr Warda (Egypt) wins a free kick in the defensive half. Attempt missed. Amr Warda (Egypt) left footed shot from outside the box is close, but misses to the right. Tarek Hamed (Egypt) wins a free kick in the defensive half. Corner, Russia. Conceded by Ali Gabr. Attempt missed. Mohamed Salah (Egypt) left footed shot from outside the box misses to the left. Substitution, Russia. Fedor Kudryashov replaces Yuri Zhirkov. Fedor Smolov (Russia) is shown the yellow card for a bad foul. Ramadan Sobhi (Egypt) wins a free kick in the defensive half. Substitution, Egypt. Kahraba replaces Marwan Mohsen. Substitution, Russia. Fedor Smolov replaces Artem Dzyuba. Hand ball by Aleksandr Samedov (Russia). Foul by Tarek Hamed (Egypt). Substitution, Russia. Daler Kuzyaev replaces Denis Cheryshev. Goal! Russia 3, Egypt 1. Mohamed Salah (Egypt) converts the penalty with a left footed shot to the top right corner. Delay in match (Egypt). Video Review. Penalty Egypt. Mohamed Salah draws a foul in the penalty area. Penalty conceded by Roman Zobnin (Russia) after a foul in the penalty area. Ahmed Fathy (Egypt) wins a free kick in the defensive half. Attempt missed. Abdallah El Said (Egypt) right footed shot from outside the box is high and wide to the right. Substitution, Egypt. Ramadan Sobhi replaces Trézéguet. Attempt missed. Trézéguet (Egypt) right footed shot from outside the box is close, but misses to the right. Assisted by Mohamed Salah. Substitution, Egypt. Amr Warda replaces Mohamed Elneny. Attempt missed. Ali Gabr (Egypt) header from the centre of the box misses to the right. Assisted by Mohamed Elneny following a set piece situation. Goal! Russia 3, Egypt 0. Artem Dzyuba (Russia) right footed shot from the centre of the box to the bottom right corner. Assisted by Ilya Kutepov following a set piece situation. Aleksandr Samedov (Russia) wins a free kick in the defensive half. Goal! Russia 2, Egypt 0. Denis Cheryshev (Russia) left footed shot from the centre of the box to the centre of the goal. Assisted by Mario Fernandes. Trézéguet (Egypt) is shown the yellow card for a bad foul.